In July 1943, the Frankfort Electric and Water Plant Board was formed to operate the water works and the electrical distribution system. Through the years, the storage and distribution systems have been enlarged and supplemented. Additional booster pump stations and tanks were added to the system as Frankfort grew and demand increased. In 1962, the reservoirs that had been completed in 1886 were renovated, covered, and enlarged to hold 9 million gallons of water. In 1972, construction began on a new 18 million gallon water treatment facility, was completed in 1975, and is still in use today. The Frankfort Plant Board has over 300 miles of piping in the distribution system with approximately 10,000 valves, over 1600 hydrants, and over 15,000 meters. In addition, the system consists of six water tanks with pump stations that supply pure, safe, potable water to our customers while ensuring fire protection to consumers. We serve over 50,000 people within our system and our water travels as far as Woodford, Anderson, Shelby, Scott, Henry, and Spencer Counties. This impacts the lives of approximately 141,000 people daily. We are available every hour of every day to continue to serve the people the Frankfort Plant Board has an impact upon. Monthly prices for both within and outside city limits of Frankfort. Kentucky's water is a precious, limited resource and conservation is the link to balancing present and future water needs. Click below to see how you can help. 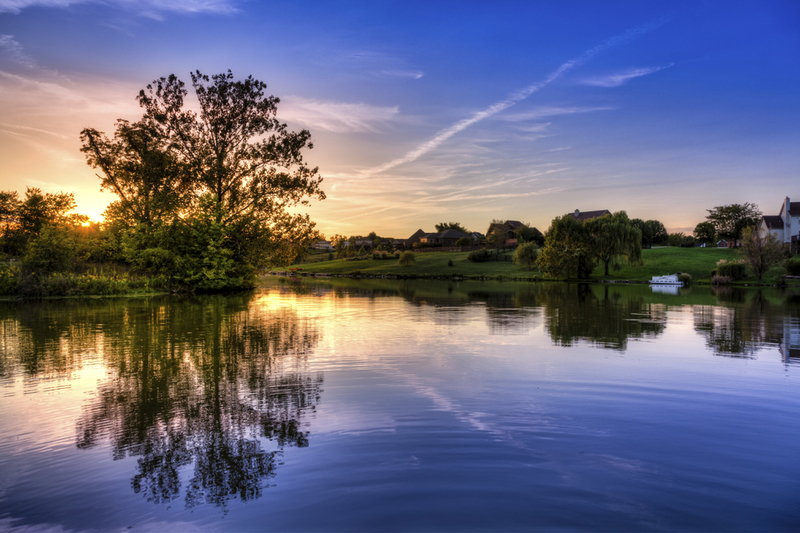 Visit the water (FAQ) to find answers to common questions about water pressure, coloration, easements, meters, Chloramine and more. The Alliance for Water Efficiency offers a quick and easy Water Calculator to show which water uses in your home are efficient and which are not. Learn the most efficient and sustainable ways to keep your water consumption low while maintaining the health and life of your lawn and garden. How often do you get service life out of water tanks for 130 years? We here in Frankfort have been fortunate to have been served by our water reservoir in Tanglewood since 1885. That is an amazing fete. The Water Department manages water throughout our system by routinely monitoring and consistently collecting samples for chlorine residual and Total Coliform testing. We test by the size of our population by law, but we test over and above the requirements. We test at tanks, pump stations, and at construction sites for new lines. We also troubleshoot complaint calls from our customers. We do lead, copper and asbestos testing of our system and meet all environmental protection agency standards and have confirmed that there are no health concerns to our customers. We protect our customers from unacceptable substances getting back into our system due to back siphonage or back pressure from other sources. Water circulated through our system is monitored closely to ensure all specific points of the system have adequate supply of pressure, fire protection and duration within the system. The Distribution system is flushed annually to ensure that our water lines are clear of any suspended materials that may have settled in or accumulated on the bottoms of the water main lines. This high flow water testing ensures the flow rate through the pipe and the inspection and maintenance checks to each fire hydrant will ensure their working ability in times of need to aid fire departments. We survey our system for deterioration problems and routinely check for potential problems. Corrective and preventive maintenance is necessary to a distribution system. This ensures the safety of water and results in fewer interruptions of service. Along with routine maintenance of the distribution system, the Water Department has emergency procedures with authority to act on them. We check and correlate our lines for leakage along with looking for corrosion of lines. We inspect hydrants and exercise valves. We also inspect tanks and pump stations routinely. All our meters are tested for accurate measuring. The Frankfort Plant Board monitors and keeps records to ensure we are within guidelines of regulations for drinking water. We train our personnel to do all our jobs through certified programs of training. That engages them in performing qualified and capable duties with knowledge and skill and to do them safe as possible to protect workers and customers from injury or loss of property. We continue to educate and train to keep workers safe, efficient, and more knowledgeable of their profession and encourage individuals to accomplish and take active roles to improve their performance. The Frankfort Plant Board (FPB) works closely with the U.S. Environmental Protection Agency (EPA) and Kentucky Division of Water to ensure that the water we provide customers meets federal and state regulatory standards. The company conducts tests in our distribution systems in accordance with the EPA’s regulatory requirements, which locally includes the collection of 30 samples from customers’ properties in our service area. FPB’s most recent lead sampling and analysis were taken in 2013 on the water throughout the distribution system. The results of these tests were well within the compliance regulations. In fact, no homes exceeded the limits for lead at that time. EPA requires lead and copper tests every three years, and we are scheduled to take the next set of samples during the 2nd & 3rd quarters of 2016. Results from our lead samples are provided to those individual customers involved in the sampling and we also make system-wide information available to our customers through delivery of an Annual Water Quality Report. The Frankfort Plant Board has used corrosion control treatment methods since 1983 and during that same time period our sampled water has always been in compliance with regulatory standards. What is Frankfort On Tap? 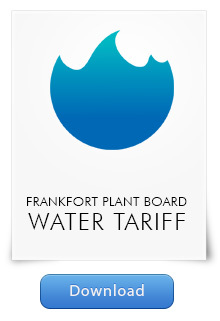 In order to raise awareness, and to promote the value of tap water, FPB has branded its water as Frankfort On Tap. To learn more about Frankfort On Tap follow the link below. Please review our Tariff for detailed information on service requirements and rules and regulations.